We have long ignored our guest bedroom and it has been furnished with hand-me-down furniture from other spaces. Sound familiar? Surely we’re not the only ones who use the guest room as the final stop for furniture before it heads out the door. It’s such a gracious, welcoming plan! Or maybe not. We still haven’t redecorated the entire room, but we gave one side a pretty dramatic change that makes the whole room feel more intentional. Here is the pathetic before shot. 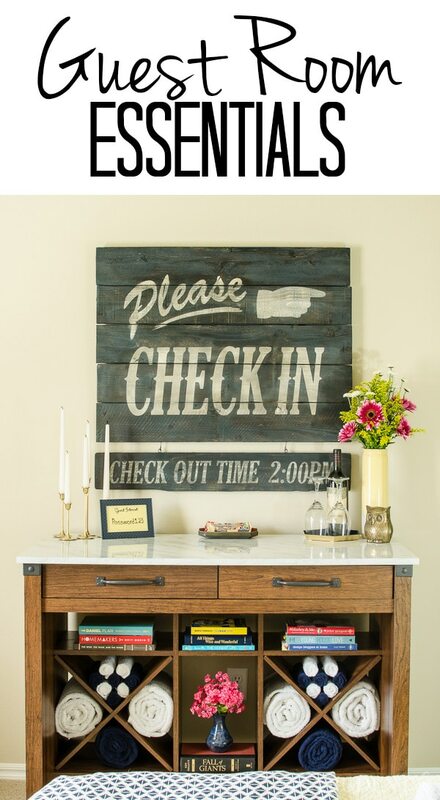 You’d feel totally welcome and calm as a guest, right? Well thank goodness the room now has some sweet organized style! 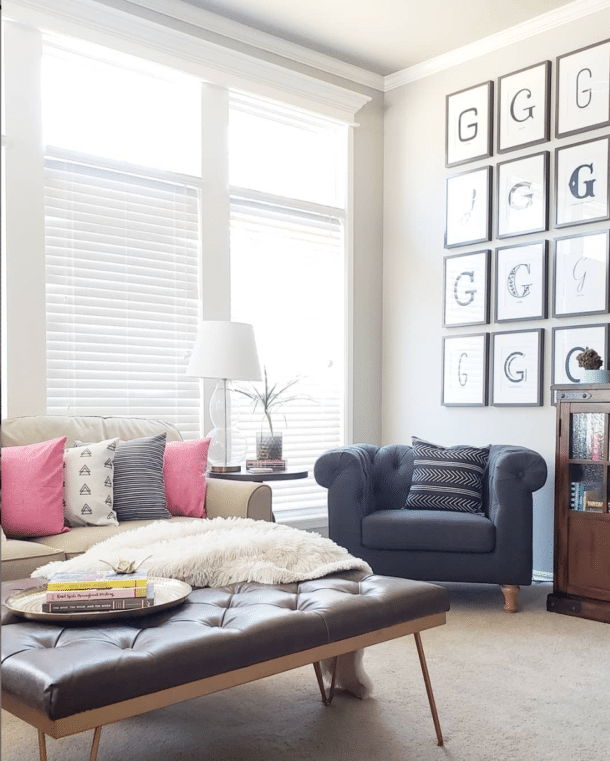 Sauder reached out to me a few months ago and asked if I’d be willing to style a piece of their affordable furniture in a creative way. AND they wanted to use the photos in their new Put Together lookbook. I was beyond impressed when I saw the furniture they wanted to highlight. The Cason Forge Gourmet Stand stood out as my favorite, but I knew we didn’t have room for it in the kitchen or dining room. Thank goodness for brainstorming and Sauder’s encouragement to think outside the box! As you saw above, the scale of the stand is perfect for the guest bedroom. The large surface will be a great drop zone for keys, purses, etc since it is right inside the bedroom door. Our guest bathroom doesn’t have a towel cabinet, so the towels were previously stored in a game room closet. Not a huge deal, but also not really intuitive or convenient for guests. 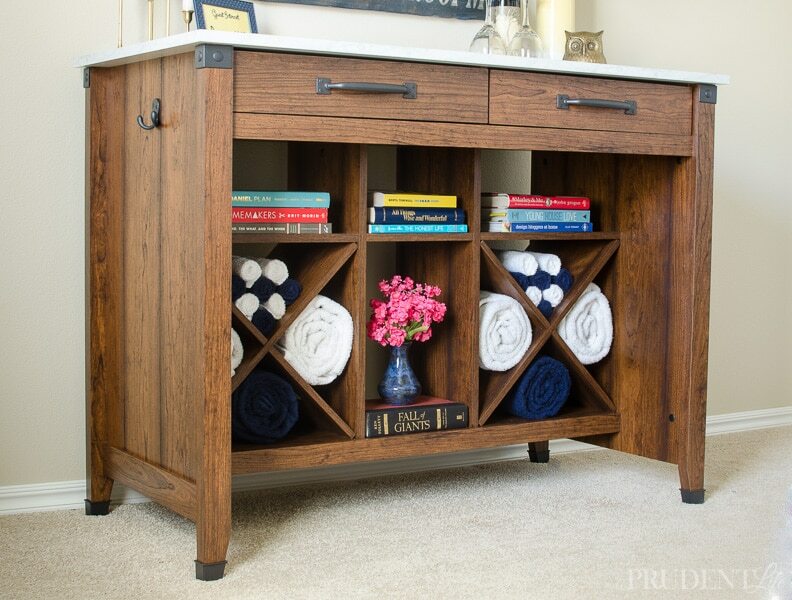 The open wine storage of this cabinet works out perfectly for towels! The additional shelves have plenty of space for a variety of reading material. The drawers are huge and have lots of space for more guest room essentials. In one drawer, I added some fun local maps and guides, along with some stationary items. The second drawer holds all those toiletry items that occasionally get left out of a suitcase. In additional to the basic items you’d find in a hotel bathroom, I added things like toothbrushes, ibuprofen, and band-aids. This might have just been an excuse to see what was new in fun travel sizes! 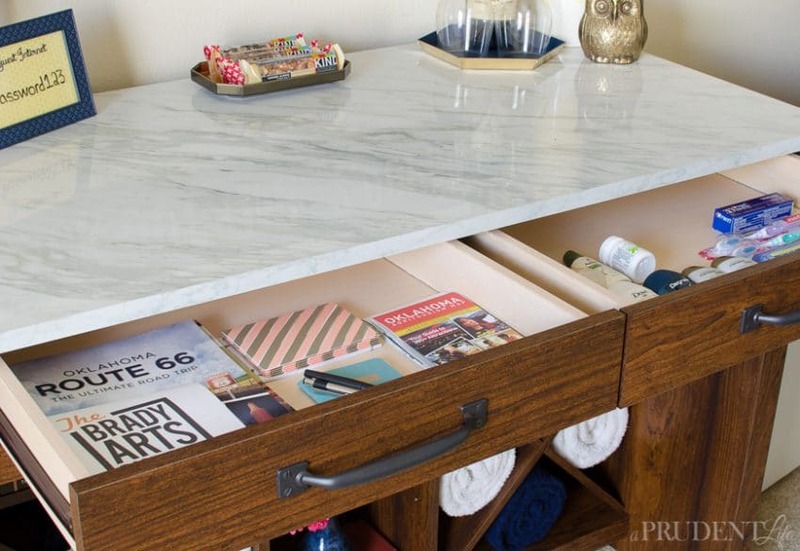 The huge (and gorgeous) marble-look top has plenty of space to mix functional items with decor. For the left side, I picked up some vintage brass candlesticks for around $1 each. For another dollar, I got a basic frame to make a wifi password sign. 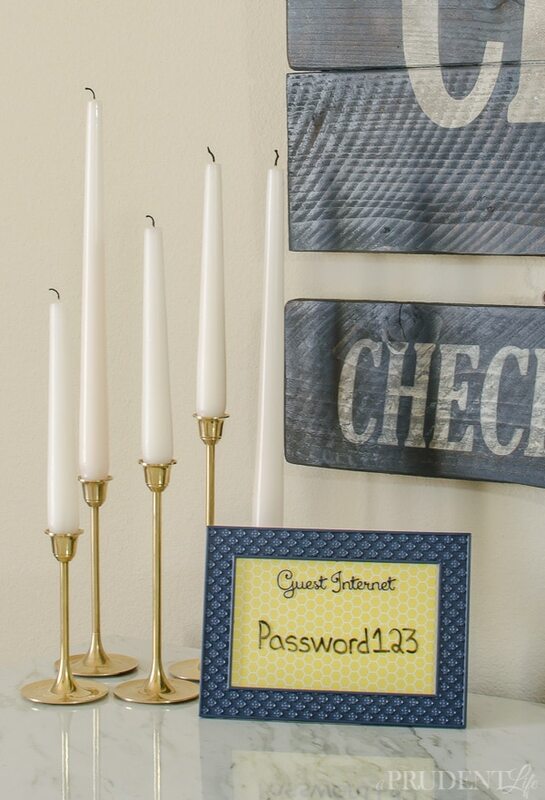 It is DEFINITELY essential to make sure your guests can access your internet connection. When you are updating your guest bedroom, think about what you are looking for in a great hotel stay (free wifi baby!) and duplicate that feel in your guest room. 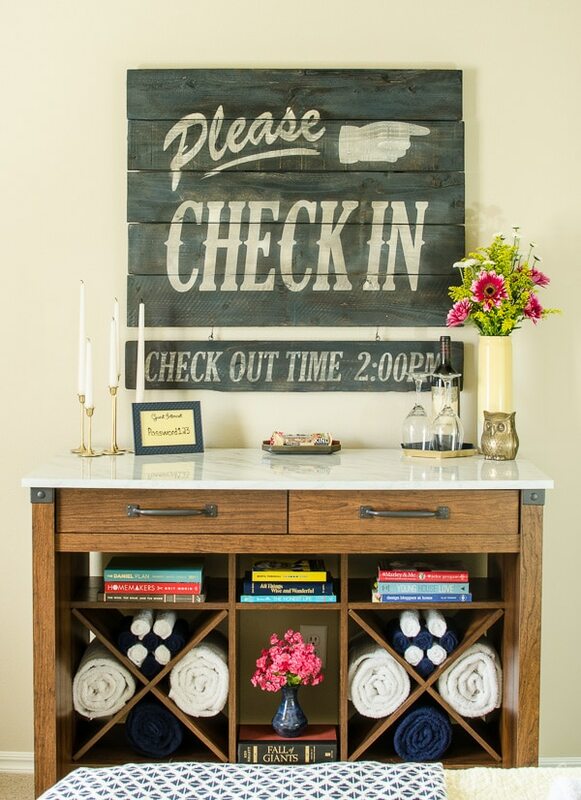 The items on the right side of the stand are less essential and more about really spoiling your house guests. 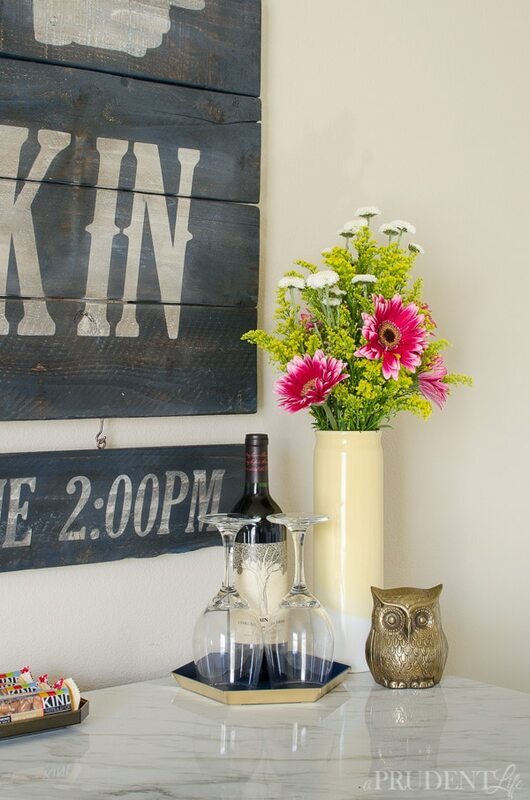 I added some fresh flowers (look for inexpensive bouquets at the grocery store). Taking a cue from the original intent of the Cason Forge Gourmet Stand, I also added a bottle of wine and a couple of glasses. 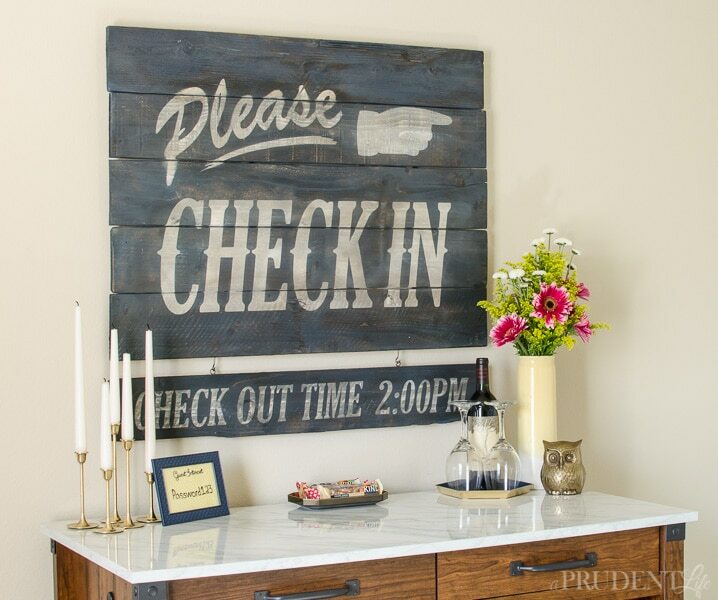 If that isn’t appropriate for your guests, a few bottles of water would also be appreciated. Guest bedrooms are normally short on square footage, so I love that we were able to cram so much function into a small space. We’ve got towel storage, stationary, toiletries, snacks, AND miles of style! 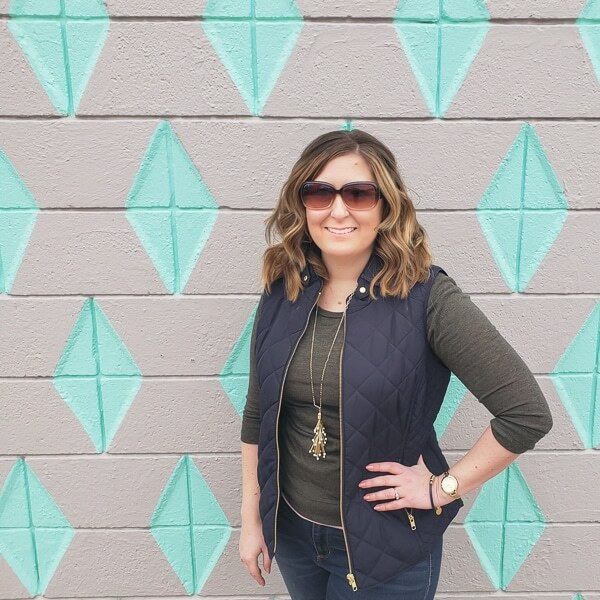 I’d love for you to take a minute to see the other bloggers featured by Sauder furniture in the Put Together lookbook. 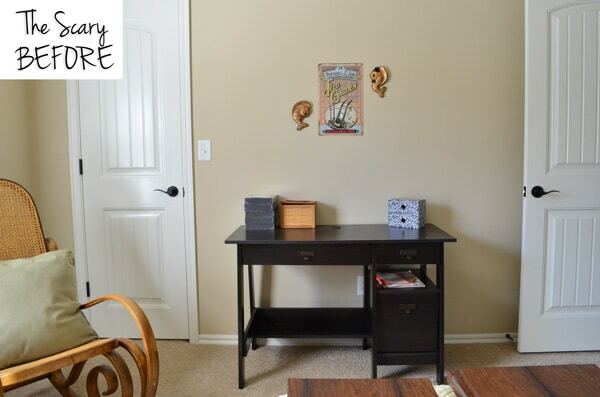 It’s so fun to see how different people decorate with the same piece of furniture. What guest bedroom essentials did I miss?